I'm back to the office from my vacations at the Costa Rica's Pacific North Coast. It was a wonderful long and easy going time at the beach. It is good to remember life without phone or Internet access, watching the sky and the horizon at all times, surrounded by real nature and tall beautiful trees. It was a great time with family and friends, perfect to charge batteries for this New Year. I wanted to share some great news I received when I came back to the office: TwittZure, my Twitter Silverlight 3 client running on Windows Azure cloud platform got a case study published at The Silverlight Team Blog. This is great not only because my app is being showcased at the very Silverlight development team blog, but also because it all started as a small personal project that with Schematic support and my colleagues help developed live, public and fully working Azure cloud application. It’s always great to see your work and effort live and get comments from people who are actually using it. This is just the first step (after all, it’s a beta release). 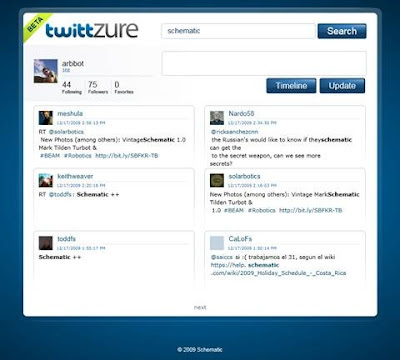 TwittZure will continue to grow and explore more and more features of Silverlight, the Azure cloud platform and off course, Twitter’s public APIs. I’m proud to get some buzz around the application and have so many positive comments that make me want to keep working on it. Please go ahead, check out the case study and try the application if you haven’t already. Take a few minutes and leave comments and suggestions. I know there are many improvements to make, and I’ll be very happy if you want to share your thoughts about it.